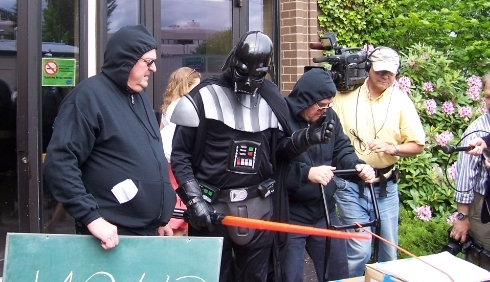 OLYMPIA - Tim Eyman (wearing a Darth Vader costume) and his cohorts arrived at the Secretary of State's Elections office this morning, to dupe the media into giving them more coverage for their campaigns to destroy transportation funding and legalize discrimination. Eyman turned in NO SIGNATURES for Referendum 65, and said he had no idea how many signatures might have been collected. Eyman only said he would be back the next day at 4 PM to turn in signatures for Referendum 65. Eyman did have petitions - but they were for Initiative 917. And according to Eyman, the campaign for I-917 only has about 142,000 signatures - roughly 110,000 - 120,000 short of what is typically needed these days for an initiative to qualify. Even though Tim brought down boxes of signatures for I-917, he didn't turn those in, either. Most major media outlets (including the four big Seattle TV stations - KOMO, KING, KIRO, KCPQ) were there, and many reporters were disgusted to learn that Tim was once again just trying to use them. Seattle Times chief political reporter David Postman and Stranger reporter Eli Sanders were among the most angered, and peppered Tim with pointed questions about his motives and credibility. Eyman partner Mike Fagan even told reporters, "Feel like you've been duped this morning? Well you have." This was one of the most unprincipled press conferences I’ve ever seen, and my sense is that the reporters whose time was wasted this morning are furious. I hesitate to even write about it, given Eyman’s “no such thing as bad press” mantra, but I do think it’s important to give a sense of how dishonest he’s willing to be in order to get a camera in front of him. It will be interesting to see how the dailies and the television stations handle this stunt — if they give it any attention at all. Couldn't agree more. For too long the media has given Tim Eyman too much free press and too much exposure. When will it become clear to reporters that Eyman thinks they're worthless, just tools to be used in his campaign efforts? I showed up representing NPI not to give Eyman exposure that he doesn't need, but to provide opposition. We make no secret of the fact that we're not objective on this blog. We never give Tim Eyman free press or a free pass - we constantly deconstruct his phony arguments, lies, and sound bites, and we're going to continue doing that for as long as he's in business. Perhaps the state ought to do a performance audit of Tim Eyman, liar, who uses anything and everything at his disposal - the media, public resources - to advance his campaigns. Eyman is no king or populist hero. He is basically a greedy businessman making money by destroying funding for public services that improve our communities. Despite all of his boasting and crowing, there's the chance he won't have enough signatures tomorrow to qualify Referendum 65. And if that's the case, it will be more apparent than ever that Tim Eyman is powerless and unpopular among Washingtonians.